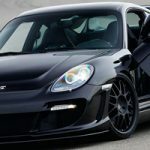 Gemballa recently released images of a 650bhp variant of it’s Avalanche program. It’s one of a number of cars that the company has on their website in the same spec, however, it’s the first that we’ve seen with butterfly doors! 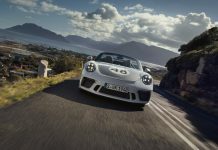 As with any Gemballa tuned car, the list of modifications are extensive. To start with, several chassis modifications have been made to the car to bring it in line which the Avalanche model line-up. A new front bonnet, front skirt and front spoiler have all been added to the car as well as a rear skirt and a rear spoiler. New headlights finish the cars head on looks. The Butterfly doors may be impractical for anyone wanting to park in a tight space, however they give the car real presence and character. A new set of ‘Racing’ 20″ alloys hide a Gemballa sports brake system and new coilover suspension units. All of these modifications are required to keep the 650bhp engine in check. A 4 pipe sports exhaust system finishes of the visual modifications on this car. The interior shots also reveal Avalanche-spec changes. Sport seats, a new steering wheel, floor mats, instrument dials, alloy pedals and a short shifter conversion are all benefits of the Avalance product line. We’re not 100% sold on the need for butterfly doors, however we’re sure many potential new owners (probably from Dubai) will be. Leave us your comments.